On the 16th, I had the amazing opportunity to go and see the first preview of Stratford’s production of William Shakespeare’s A Midsummer Night’s Dream. I honestly can’t remember a better theatre experience than what I was a part of that afternoon. First, I want to address the play itself, because it was a fascinating take on the play that has definitely left me thinking. Chris Abraham, whose production of Othello last season was also stunning, made some very interesting and calculated changes to this text, but certainly for the better. I’m going to try to talk about this show without giving away too many ‘spoilers’, although that’s not exactly easy to do. First of all, the frame narrative of the wedding was a wonderful set up for a show about love and marriage and fighting for both. This frame narrative also gave the play a wonderful location: a back yard. The fact that the stage was covered in turf made everything so wonderful and real, and as I’ll discuss later, added to the immersive experience they created for this show. That’s the other wonderful thing this frame narrative provides: the possibility for an immersive experience. Before the show there were actors roaming the isles, saying hello to all of the ‘guests’ and there were decorations in the theatre. Because weddings are such a community event, just like the theatre, it easily creates a way for everyone to get involved. Second, the changes in gender of the characters was a bold choice, but one that made the play modern and beautiful on a whole other level. By including homosexual couples in the play, it not only raises the stakes when Hermia fights to be with Lysander (who is played by a woman), but it also updates the play to what our modern notion of love is. At first, with the changes from he to she or her to him, I wondered if it might affect the meter of the play, but it really doesn’t, as most of the changes had the same number of syllables and essentially amount to the same thing. Thus this change, which I was unsure of at first, fit seamlessly into the play, and added to this modern notion of love that was shown throughout. The other major change was that Titania and Oberon were both played by men, and at that, those two men share those roles, changing with each performance. Once again, the fairy world was representing the outside world but in a different way. Instead of mirroring the royal couple of Theseus and Hippolyta, they mirror the couple whose wedding reception they are performing at. Both actors (Jonathan Goad and Evan Buliung) played their roles very well, and I’d be excited to see the show again when they play the opposite character. The rest of the cast should not go without mention. It was simply a stellar cast. Stephen Ouimette as Bottom was everything I had hoped he was going to be. I was also very impressed with Chick Reid, who played the mischievous Puck; she made us all laugh and want to play right along with her. The children in the play were wonderful as well. They were so sweet, and added this sense of innocence that comes with the fairy world. The Rude Mechanicals were also marvellous! Their plotline of the show has to be on of my favourites in all of Shakespeare. Watching them attempt to put on a show while watching a show is so much fun, and they are just so…inept, it makes for a roaring good time! Overall, I was thrilled with this show. Truly, I didn’t want to leave the theatre, I didn’t want to break the magic of the place that I was in. I could have lived in that backyard for ever. The best, and I mean BEST part about this experience was where my friend and I got to sit. We were what they call their “Gutter Guests”. 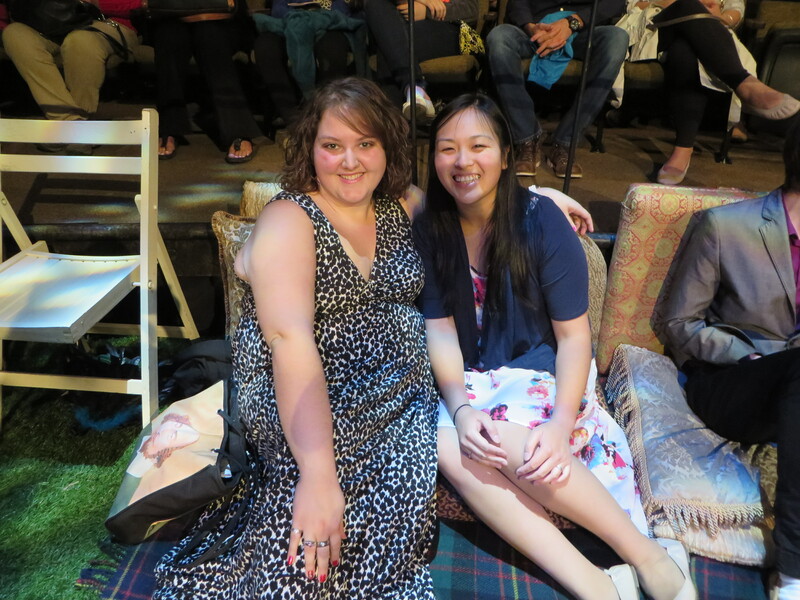 We sat on these beautiful pillows and cushions along the side of the stage. Throughout the performance we sat beside some of the actors, interacted with them, and tried not to trip them as they went past us! We were totally immersed in the play: we were not given programs and were brought down separately into the theatre. It was amazing. To be that close, to be able to be a part of the show was an incredible experience. I’ve included the picture of my friend and I taken by one of the actresses. However, what was the best part of the night for me, and a moment I shall never forget, was towards the end, when they are supposed to be doing the jig, we were asked to come up on stage and dance with the cast. I have never been so happy. I cry every time I talk about it. To have been on stage, during a show, at the Festival theatre, is a dream come true. I will never EVER forget that afternoon. So basically, go and see this play. Please! It’s fabulous, and I think will appeal to everyone. There were several groups of students who laughed and sighed and were right in the show as well, which for me is a great sign of a great show. BRAVO to all involved, and thank you for an afternoon I shan’t soon forget!